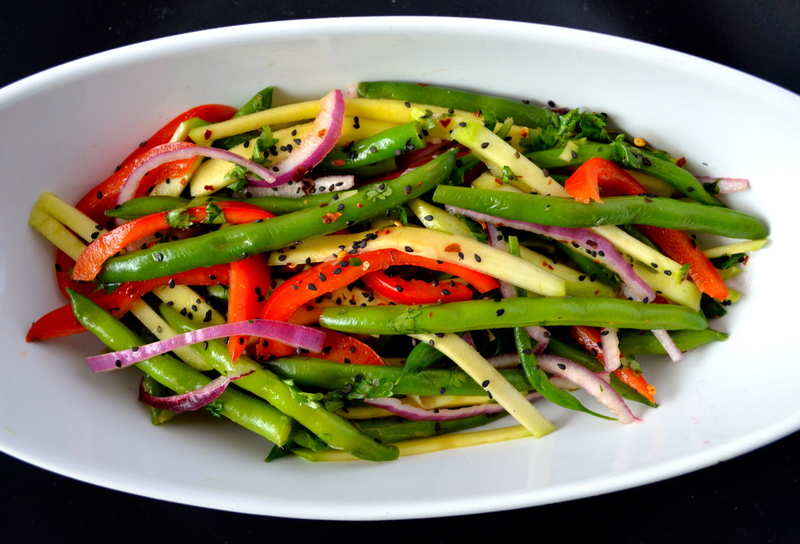 With easy ingredients that takes seconds to prepare, this salad takes the four dominant Thai senses—sour, sweet, salty, bitter—into a simple, but flavorful, side dish. Bring a large pot of water to a boil. Have a bowl of ice water ready. Add the green beans to the boiling water. Cook for 2 to 4 minutes, under tender crisp. Use a slotted spoon to remove the beans, putting them into the ice water. Drain and set aside. Put the mango, red pepper, red onion, and cilantro in a large bowl. Add the green beans and toss to combine. Put the vinegar, brown sugar, sesame oil, garlic powder, a few shakes of salt, and a sprinkle of chili flakes in a small bowl. Whisk to combine. Toss with the green bean mixture, coating well. Let sit at least 1 hour before serving. Garnish with sesame seeds, adjusting seasoning to taste before serving.